Swerving back into my blog with the great news that Babymouse is now a Word Puzzle Game! Available at Google Play Store and soon on iTunes. 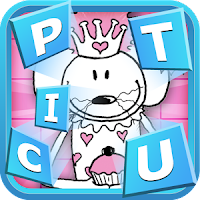 Play the Pop the Pic Babymouse -Word Puzzle Game based on the popular Babymouse kids comic book series. Reveal the comic book pictures piece by piece and try to guess the word. If you liked 4 Pics 1 Word, you'll love this new Pop the Pic word puzzle game. Kids love Babymouse star of the popular, award-winning, hilarious, pink graphic novel series showcasing the trials and tribulations of elementary school. The sassy mouse with attitude to spare has charmed her way into the hearts of kids, parents, and teachers everywhere! Now you can play the game based on Babymouse! Now still waiting on Babymouse fabric, please. Even Downton Abbey has its own fabric line now, why not Babymouse? As an early member of the Kidlitosphere I have tried when possible to attend the annual KidLitCon in the different parts of the country. This year, joy and rapture, the meeting is in my almost backyard. Looking forward to it!! 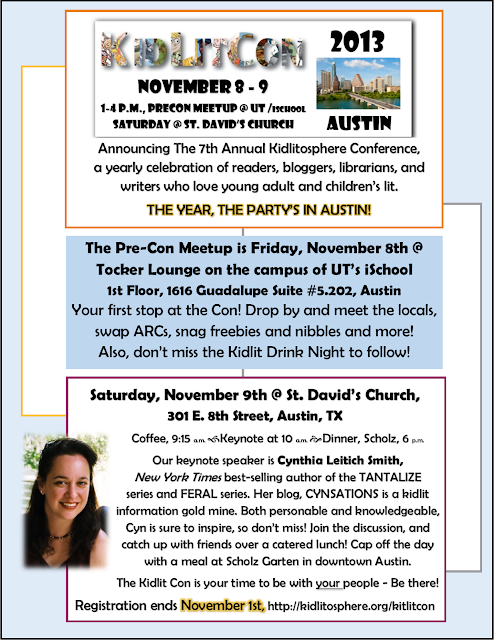 Texas bloggers, c'mon over! Registration is HERE. Fun to follow the epic battle between Snow White and Bilbo Baggins raging in a hashtag war now on Twitter for the MTV Movie Award for Best Hero 2013.